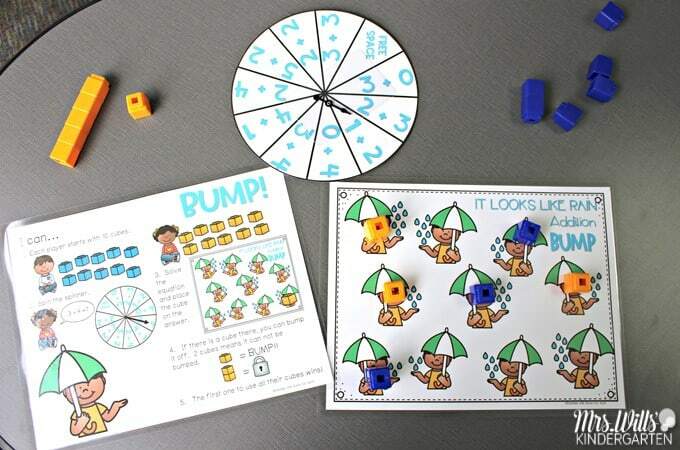 Bump games for your math & literacy centers or small group. 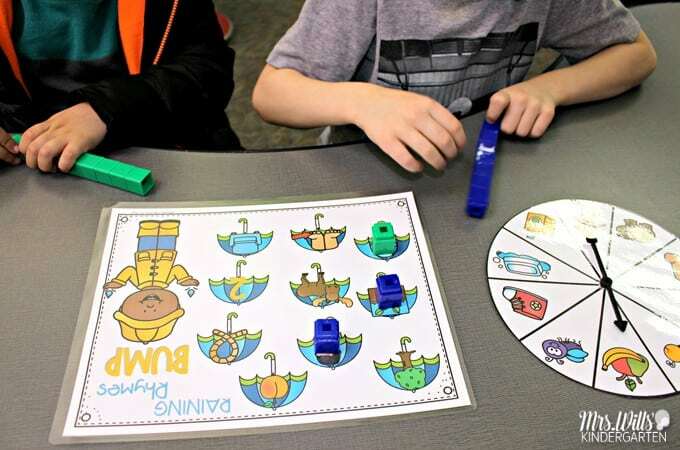 Teach this simple and engaging game to your kindergarten class and swap out the skills to have a predictable center or station all year long! 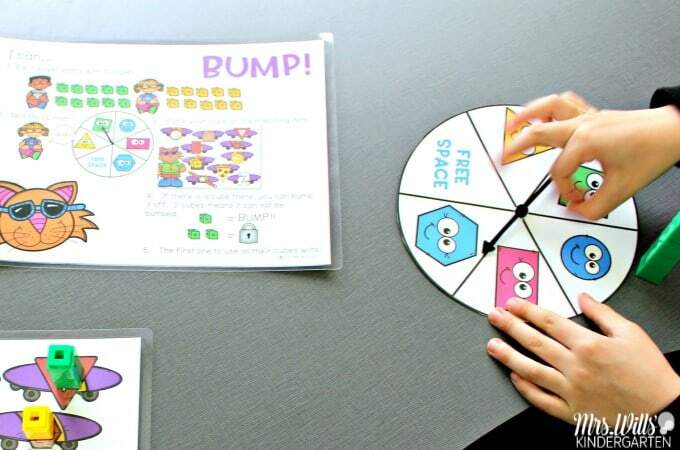 The BUMP games are purposely predictable so you can teach it once and use it throughout the year. 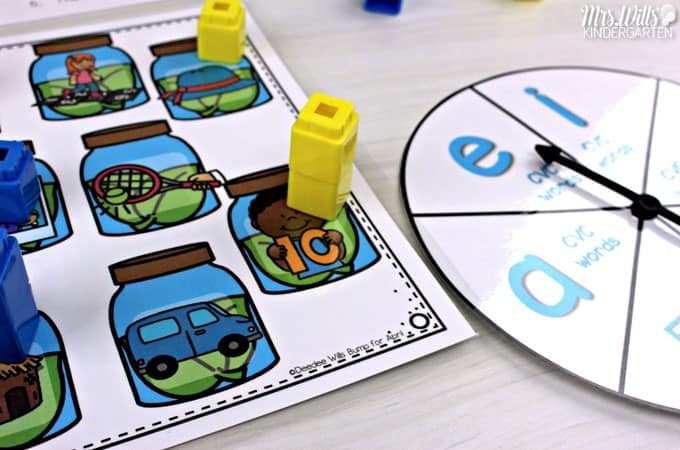 I always teach this game early in the school year and add it into my station rotation once my students are ready. It is also a fun game to play during small-group. There are a variety of math and literacy skills. Pick which skill you want your students to work on, put it into a center and you’re golden! 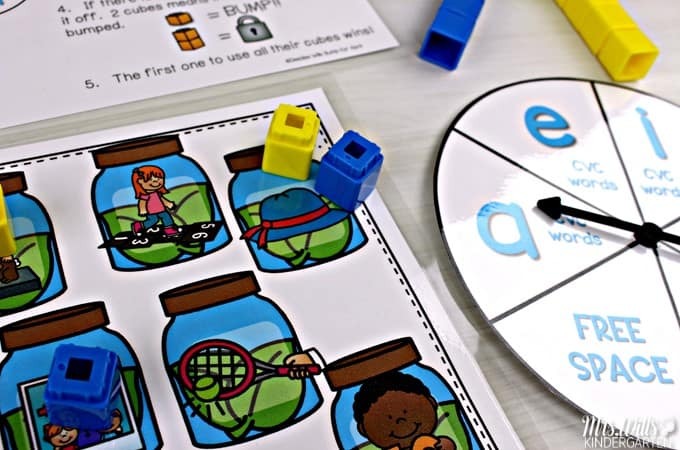 It’s so easy and it keeps students engaged! 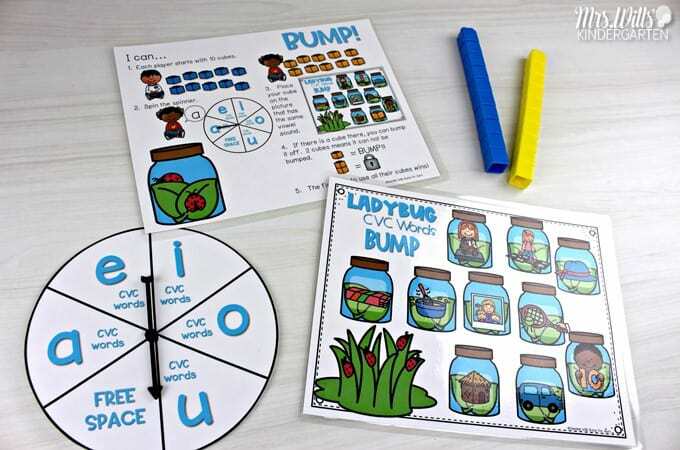 The rules for BUMP are simple and each game comes with an I Can card as a reminder to students. You’ll just need to add cubes and a spinner. So step one, prep your materials! Print on cardstock and laminate for durability. Cut out the paper circle and add the spinner. Spinners are pretty inexpensive and you can order them from Amazon by clicking, here! Each player starts with 10 cubes – 2 different colors. Decide on a rule to determine who will go first. Maybe rock, paper, scissors; youngest; oldest… whatever works for your class! Player 1 spins the spinner. 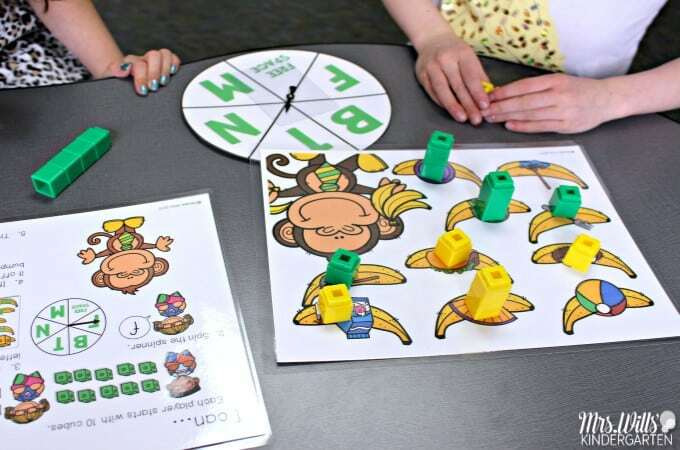 For this particular game, the players are finding 2D shapes that match the spinner. Another game may be finding the beginning sound or counting. There are a variety of skills! Player 1 then places one of their cubes on the mat. Then, player 2 spins and does the same thing. Now… here is where BUMP comes into play. If a player wants to put their cube where their opponent’s cube is they can, ONLY if there is 1 cube and not 2 stacked together. For example, the yellow player landed on /a/ and placed their cube on the hat. The blue player then also landed on /a/ and decided they wanted to put their cube on the hat and BUMP the yellow player. This can be done because there is just one yellow cube. The yellow player takes their cube back and the blue cube stays. What! How do players even stack cubes?? When a player lands on the same space, they can double their cubes. For example, with this game, the yellow player landed on /e/. She already had a cube on “ten” but wanted to put another one. When they do this, it locks their cube and it can’t be bumped. The game continues until a player is able to place all of their cubes on the mat. The first player to do this is the winner! 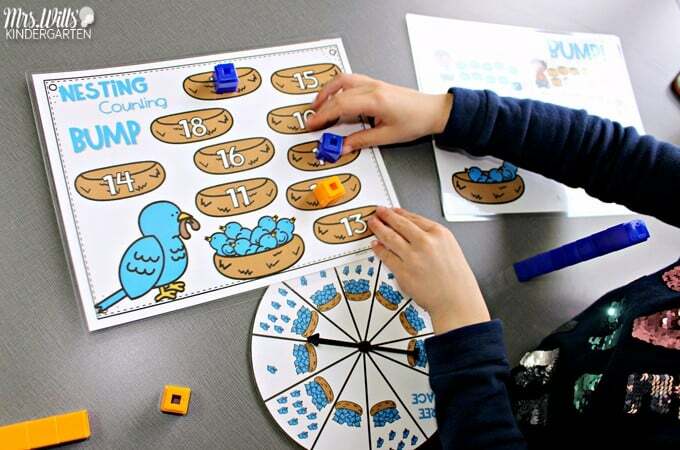 If you are looking for more evergreen activities that can be used at any time of the year, check out the year-long set with 26 math and literacy games! 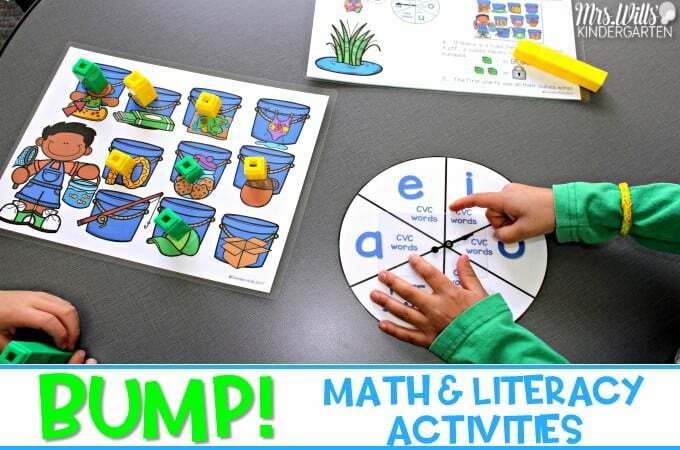 Welcome Spring in your classroom with BUMP Math and Literacy for April. 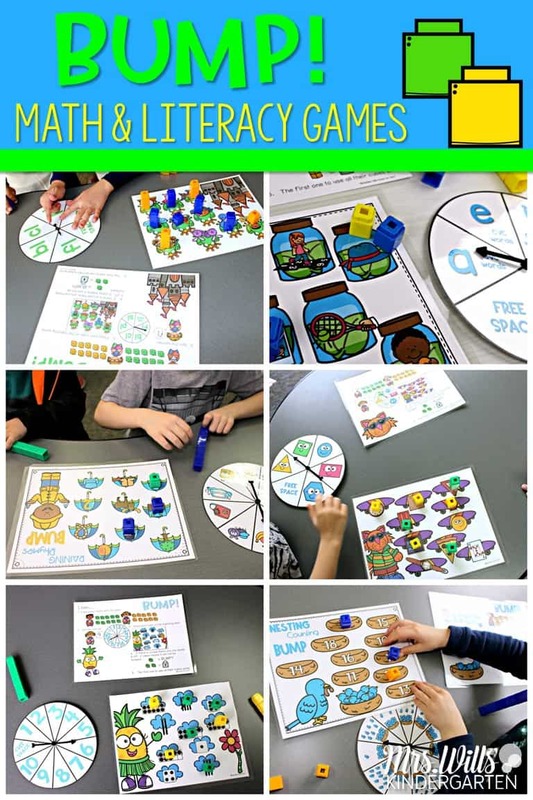 Here are some more ideas for math and literacy centers!